Sr. Nadine Buchanan, OP, addresses Columbus Catholic High School and Ohio Dominican University students. The Gospel reading for Sunday, January 27 was perfect for the first day of Catholic Schools Week 2019. From First Corinthians 12, the first verse was: For as with the human body which is a unity although it has many parts — all the parts of the body, though many, still making up one single body — so it is with Christ. We all have a part to play in the continuation and the strength of our Catholic schools. Whether parents or teachers, students or volunteers, each of us contribute to the strength of each school, and to the value that each school’s education provides to our precious young people. This past weekend I was blessed to see the body of the Church and of our Catholic Schools in action, as Columbus diocesan schools and our congregation’s sponsored University, Ohio Dominican University, came together to minister to the marginalized and share Christ’s peace. 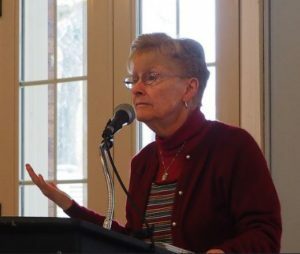 It all started in spring 2018 when Ohio Dominican University hosted Catholic Schools Day. Students from the local high schools toured the university, then accepted a special challenge – to create a social justice project that would make a positive impact in the Central Ohio community. Human Trafficking survivor April Thacker. 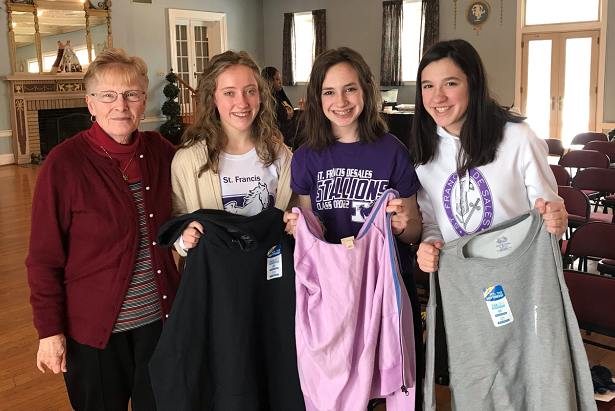 Students from Fisher Catholic in Lancaster, OH, created a plan to provide much-needed clothing, food, and personal items to trafficked women in Columbus, OH. 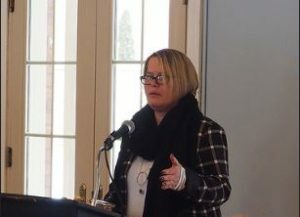 Andy White, Director for the Center for Student Involvement at Ohio Dominican and Sharon Reed, Dean of Student Life & Associate Vice President for Enrollment and Student Success, offered $1000 in seed money and the “Not For Sale: Coming Together to End Human Trafficking” community service event became a reality on January 27, 2019. I had the opportunity to introduce the Catholic high school and Ohio Dominican students to my dear friend April Thacker, a brave survivor of human trafficking. April’s presentation put the work of the day into context, as students packaged newly purchased hoodies, food, and personal items to be distributed to homeless and trafficked women on the streets of west Columbus. Among the students was Allie Sarff from St. Francis DeSales High School. She recently donated many beautiful handmade blankets for the homeless women here in Columbus. When she heard about the “Not for Sale” event, she collected more than $2000 from students and teachers at the Columbus High School to buy hoodies and other items to donate to the event. 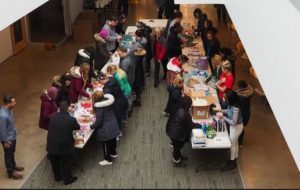 In total, the event brought in 150 new hoodies, 50 $5 McDonald gift cards donated by Andy White and the ODU Center for Student Involvement, hundreds of hygiene items collected by ODU staff, and nearly $1500 for the Dominican Sisters of Peace’s ministry with homeless and trafficked women. In addition, 50 packages of hygiene and food items were packaged into bags to be distributed to women living in abandoned homes and on the street. All of the Dominican Sisters of Peace are proud of the students and teachers at our sponsored schools, but this week, my heart is full of gratitude as Ohio Dominican students and staff helped our high school students begin a life of preaching peace and serving the people of God. 150 bags of food and personal hygiene items were packed at the “Not for Sale” event. 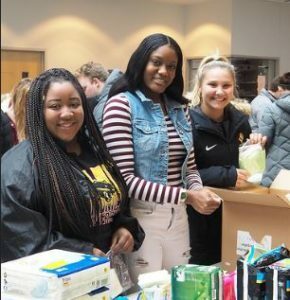 Columbus-area Catholic High School and Ohio Dominican students pack items for to distributed to trafficked women in Columbus, OH. 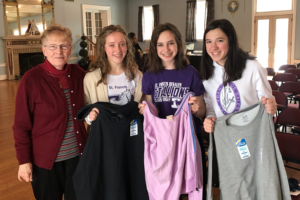 Students from St. Francis DeSales collected money to buy hoodies. Thank you, Nadine and the students at Ohio Dominican University. who need this love so desperately.